This finish is perfect for projects that need maximum resistance to water and alcohol. 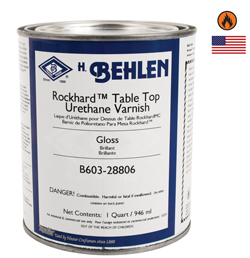 It is a top quality Urethane Varnish also has a high resistance to abrasion and is perfect for furniture such as table tops chairs, and other furniture. This product is a low VOC formula. Paint thinner and mineral spirits can be used for thinning and clean up. Available in Quarts.